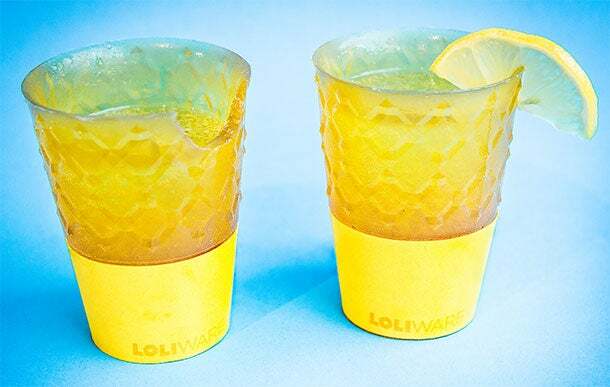 Entrepreneurs: Chelsea Briganti and Leigh Ann Tucker, who met while attending Parsons The New School for Design in New York, created Loliware, a line of edible, biodegradable drinking cups that look like colorful vintage glassware. "Loliware was born because, as designers, we wanted to have fun getting super-creative with a material, but we have a bigger vision that Loliware will replace a percentage of the plastic cups destined for the landfill," Tucker says. Tastemakers: The prototype was a hit in the design competition but a long way from being ready for market, so Briganti and Tucker entered a development phase in the kitchen of their Brooklyn apartment, continuing to experiment with agar. While gelatin "has beautiful translucency, like glass," Briganti explains, "it smells bad and tastes terrible." Agar, meanwhile, holds its shape and has the benefit of being vegan. Perfecting the taste became a priority. "We were designers turned candy-makers," she says. "We had to learn how to translate our design skills to the kitchen." Sweet support: Briganti and Tucker raised more than $10,000 through a 2011 Kickstarter campaign and renamed their product Loliware. The designers hosted parties to field-test their product and hired food scientists to improve shelf stability. They tested various flavors, including rosemary, lemon-ginger and mint, before choosing citrus for their launch. "It is incredibly versatile and goes with so many beverages, from champagne and whiskey sours to sangria," Briganti says. An additional $60,000 in angel investments and a spot in the Hot Bread Kitchen incubator in Harlem helped the pair ramp up production and allowed them to fill an order from AOL for 600 cups for the Adweek Brand Genius Awards in 2012. Liquid funds: The drinkware duo is in the process of partnering with a manufacturer that can produce Loliware in bulk. With companies like Google and Disney "waiting in the wings for us to launch," Briganti says, the pair kicked off a second round of funding this year with the goal of raising $1 million for a nationwide rollout. The edible cups are sold through Loliware.com at $14.95 for a pack of six. "We've been bootstrapping for so long, and now is the time for us to get funding to go big and experience the kind of growth we know is possible," Briganti says. What's next: Briganti and Tucker plan to experiment with cups in new shapes, sizes and designs. Eventually, they hope to manufacture a Loliware water bottle.